Book Challenge Day 15- Favorite Scene | What are we...the Whos? It took me awhile to think of my favorite scene out of every book I’ve read. I’ve read 32 books so far this year- let alone the rest of my life. Just remembering scenes from all of them is a big feat. But, after thinking about the books I’ve read this year, I knew which scene deserved to be featured in this blog. My favorite scene from this book actually takes place very early on. The author’s mother is dying, pretty horribly, from cancer and he knows the end is minutes to days away. He begins to think to himself about what he and the rest of the family should be doing in her final moments. It just may be the most real and moving scene I’ve ever read. Dave Eggers manages to perfectly capture the stream of consciousness thinking of someone whose world is crumbling around him. The thoughts range from sweet, angry, depressing and wildly inappropriate to simply desperate. It’s remarkable. Overall, I thought the book was a solid read. I felt that it had fantastic high moments hidden in very boring stories and would have benefitted from being cut down significantly. But, if you’re looking for an honest representation of human thought, look no further. 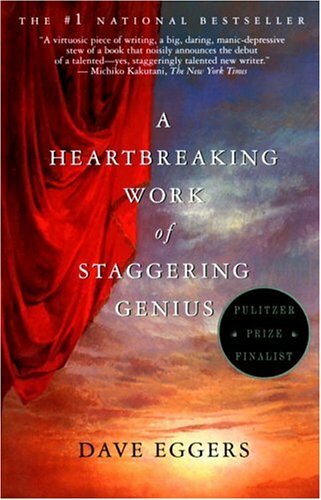 Posted in Authors, books, Reading, Writing and tagged 30-Day Book Challenge, A Heartbreaking Work of Staggering Genius, Dave Eggers. Bookmark the permalink.